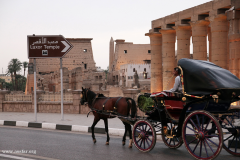 You will explore the city of Luxor in a horse Carriage. You will go through the back streets to explore the real life of the city, not the tourist city, and as well this tour will take you to the local market of the city, the market of vegetables and fruit. It is a nice and different tour to know what is the city of Luxor. One coach each two people. One soft drink per person. Tips for guide & coach for coach deriver.